Weisser Westen is a Duesseldorf artists duo formed by Angela Fette and Phillip Schulze. In her work Fette refers to the idea of the artist in the spirit of the classical avant-garde -- embracing painting, costume design, poetry, and performance art. The media-artist and composer Schulze creates and programs electroacoustic sound and light sculptures. The Düsseldorf based painter, poet and performance artist Angela Fette is known for her idiosyncratic combinations of readings and rituals in proto-avantgarde costumes, masks and hat designs. Angela Fettes paintings, site-specific installations often in combination with performative events have been exhibited internationally in solo and group shows. Angela Fette studied art at HfG Offenbach, Städelschule Frankfurt and Kunstakademie Düsseldorf. In the last decade Angela Fette regulary performed her poetry, aphorisms and manifests in front of her paintings and installations always covered by her trademark masks. In 2010 she formed the electronic pop duo Weisser Westen with composer and sound artist Phillipp Schulze featuring a harsh mix of her voice over granular and synthetic walls of sound and irregular beats. Angela Fette is also well known for her “records and slides” DJ-sets where she combines progressive, pop and avant music with found footage and images from her archive. In September 2011 Cologne based record label Apparent Extent released Angela Fettes first Vinyl LP “Vision Vulkano” of field recordings of recent actions at Kunstverein Schwerte with her artist friend and longtime collaborator Christian Jendreiko. Schulze's work is oscillating between different artistic forms of expressions. On one hand, he focuses on compositions for classical instruments, electroacoustic music via synthesizer's and self constructed software instruments. On the other hand, he develops much of his work in a visual art context. He develops sound, light, and video environments, installations, and extended concert situations with an aim at finding intersection points between visual and auditory experience as well as relations among participants, objects and site. His work has been performed or installed in Germany, France, Austria, Poland, Switzerland, Netherlands, Russia, Serbia, Australia, Korea, China, Japan, Singapore, Canada and the USA at locations including the Düsseldorfer Kunstverein / Kunsthalle, Badischer Kunstverein, Art Institute Chicago, EyeBeam NYC, Musterraum München, Kunst Museum Bonn, Kumho Museum of Art, K21 Schmela Galerie, Ars Electronica, Moers Festival, Fluctuating Images, Diapason Gallery, Japan Media Art Festival, Kunst Film Biennale Köln, Deutschlandradio Kultur, Bains Numeriques, V2 Rotterdam, Electra and Viper Basel. Phillip Schulze studied Media Art and Stage Design at the Karlsruhe University of Arts and Design, Germany with Anna Jermolaewa, Paul Modler, Siegfried Mauser, Michael Saup, and Penelope Werli, followed by a Master of Art in Music Composition at Wesleyan University CT, USA with Anthony Braxton, Ron Kuivila, and Alvin Lucier. Since 2006 Schulze gives talks and workshops at different academic institutions, that is for instance the University Alabama, the Wesleyan University and the Bauhaus University Weimar. From 2009 to 2010 he curated the space Mintrop 20 in Düsseldorf, a site for new experimental Media, Sound & Performance Art. In 2010 Schulze received the Audi Art Award, as well as a Honory Mentioning in the field of Digital Musics & Sound by the Ars Electronica in Linz, Austria. In 2011 the University of Music Düsseldorf appointed him as visiting professor of Music Informatics at the Institute For Music And Media. Weisser Westen(Angela Fette & Phillip Schulze)Angela Fette Born 1970 in Hamburg Education 1994 – 1996 Hochschule für Gestaltung Offenbach 1996 – 1999 Staedelschule Frankfurt/Main 2000 – 2003 Kunstakademie Düsseldorf The Düsseldorf based painter, poet and performance artist Angela Fette is known for her idiosyncratic combinations of readings and rituals in proto-avantgarde costumes, masks and hat designs. Angela Fettes paintings, site-specific installations often in combination with performative events have been exhibited internationally in solo and group shows. Angela Fette studied art at HfG Offenbach, Städelschule Frankfurt and Kunstakademie Düsseldorf. Analyzing the writings and performative gestures, the achievements and utopias, illusions and misinterpretations of canonized avantgarde modernists from the Arts and Crafts, Bauhaus, Russian constructivism to postwar American formalism she started to embrace these holistic aesthetic Lebensentwürfe and their counter influence on societies. In this setting “art functions as a parallel world with possible intersections with reality.“ In the last decade Angela Fette regulary performed her poetry, aphorisms and manifests in front of her paintings and installations always covered by her trademark masks. In 2010 she formed the electronic pop duo Weisser Westen with composer and sound artist Phillipp Schulze featuring a harsh mix of her voice over granular and synthetic walls of sound and irregular beats. Angela Fette is also well known for her “records and slides” DJ-sets where she combines progressive, pop and avant music with found footage and images from her archive. In September 2011 Cologne based record label Apparent Extent released Angela Fettes first Vinyl LP “Vision Vulkano” of field recordings of recent actions at Kunstverein Schwerte with her artist friend and longtime collaborator Christian Jendreiko. 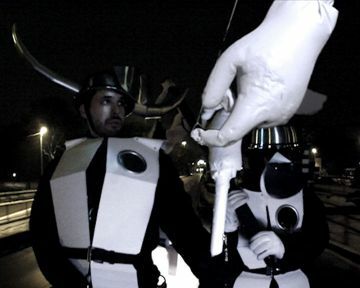 Phillip Schulze Born 1979 in Düsseldorf Education 2000 – 2006 Diplom in Media Arts, University for Art & Design Karlsruhe (HfG) 2006 – 2008 Master of Arts, Wesleyan University, CT, USA 2008 – 2009 Research Associate, at IERC Nanyang University Singapore 2011 – 2012 Visiting Prof. Musikinformatik at the Institut Fuer Musik Und Medien, RSH Düsseldorf Phillip Schulze (b. 1979, Germany) is working in the field of time-based art, currently living in Düsseldorf, Germany. Schulze's work is oscillating between different artistic forms of expressions. On one hand, he focuses on compositions for classical instruments, electroacoustic music via synthesizer's and self constructed software instruments. On the other hand, he develops much of his work in a visual art context. He develops sound, light, and video environments, installations, and extended concert situations with an aim at finding intersection points between visual and auditory experience as well as relations among participants, objects and site. His work has been performed or installed in Germany, France, Austria, Poland, Switzerland, Netherlands, Russia, Serbia, Australia, Korea, China, Japan, Singapore, Canada and the USA at locations including the Düsseldorfer Kunstverein / Kunsthalle, Badischer Kunstverein, Art Institute Chicago, EyeBeam NYC, Musterraum München, Kunst Museum Bonn, Kumho Museum of Art, K21 Schmela Galerie, Ars Electronica, Moers Festival, Fluctuating Images, Diapason Gallery, Japan Media Art Festival, Kunst Film Biennale Köln, Deutschlandradio Kultur, Bains Numeriques, V2 Rotterdam, Electra and Viper Basel. Phillip Schulze studied Media Art and Stage Design at the Karlsruhe University of Arts and Design, Germany with Anna Jermolaewa, Paul Modler, Siegfried Mauser, Michael Saup, and Penelope Werli, followed by a Master of Art in Music Composition at Wesleyan University CT, USA with Anthony Braxton, Ron Kuivila, and Alvin Lucier. 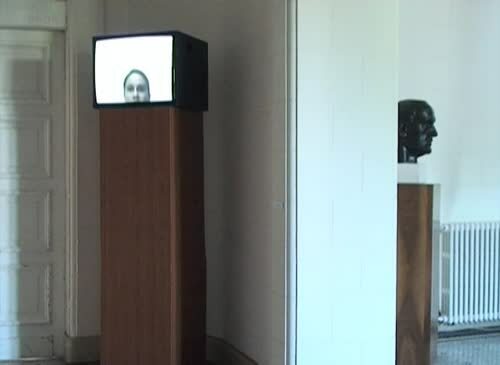 After living and working as a free artist in New York City in 2008, Schulze worked collaboratively with Louis-Philippe Demers and Armin Purkrabek as a Media-Art Research Associate at the Interaction and Entertainment Research Center of the School of Art, Design & Media, in Singapore. Research topics included interactive fine arts, augmented and mixed reality, interactive environments and interfaces – such as multi-touch tables, floors, and cylinders as well as multichannel interactive sound installations. With several of these projects, Schulze tours collaboratively around the globe, e.g. the Tiller Girls, a dance, light and sound performance with thirty-two autonomous robots. Since 2006 Schulze gives talks and workshops at different academic institutions, that is for instance the University Alabama, the Wesleyan University and the Bauhaus University Weimar. From 2009 to 2010 he curated the space Mintrop 20 in Düsseldorf, a site for new experimental Media, Sound & Performance Art. In 2010 Schulze received the Audi Art Award, as well as a Honory Mentioning in the field of Digital Musics & Sound by the Ars Electronica in Linz, Austria. In 2011 the University of Music Düsseldorf appointed him as visiting professor of Music Informatics at the Institute For Music And Media.